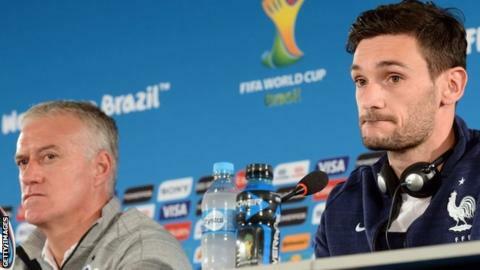 Captain Hugo Lloris believes France's performance in the World Cup so far has helped improve relations with the fans. France face Nigeria in the last 16 on Monday (17:00 BST), with the winners meeting either Germany or Algeria in the quarter-finals. Didier Deschamps' side were unbeaten in Group E, including a 5-2 win over Switzerland, and Lloris, 27, thinks the fans are showing greater support. He said: "We have noticed a change, a rekindled fondness from the fans." France, who have been dogged by controversy since lifting the World Cup in 1998, qualified for Brazil by recovering from a 2-0 first-leg deficit to beat Ukraine in a play-off. Spurs goalkeeper Lloris added: "There have been some ups and downs in the past few years that's true. "We have done what we needed and made the effort on the pitch to make the fans happy so far, but we want to go further." Liverpool centre back Mamadou Sakho, who has a leg muscle problem, is France's only doubt for the Nigeria match.